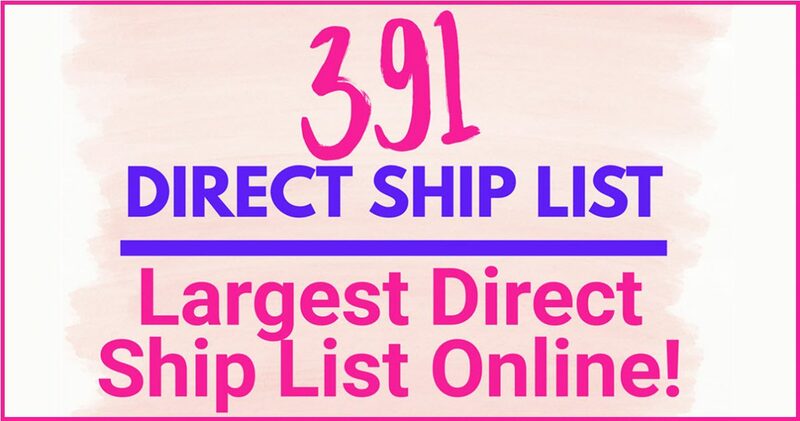 Home » FREEBIES » 391 DIRECT SHIP CONTACTS ! Largest LIST Anywhere ONLINE! Direct Shipment is all the rag in the internet freebie world. The idea is that online sellers have a surplus of inventory. It costs the seller money to let it sit in warehouses. For overseas sellers it may cost them a TON to have the ware house that holds their inventory a ton to have the warehouse ship the surplus inventory back to them. That’s where you come in! The sellers are looking for people to unload some of there surplus inventory to – FOR TOTALLY FREE! This person could be you! I have seen MANY people get a ton of free stuff with Direct Shipment. You will not order it. You don’t need to leave a review. Someday something may just show up at your doorstep. ** If you discover a problem with any person or application please leave a comment. ** SHARE THIS LIST WITH FRIENDS! ** When / If you start getting freebies in the mail PLEASE SHARE Your Pictures [ HERE ] ! ** Sometimes shippers run out of stuff to ship. This happens. You will not get something from everyone on this list. I have not done direct shipment myself so I CAN NOT guarantee you will get anything. I CAN NOT verify the legitimacy of any Direct Shipment applications I posts or the people to contact. Sign up totally at your risk. Be cautious about sending your personal information to ANYONE online. Sign up totally at your risk. NEVER. EVER. EVER. Send anyone money, credit card information or passwords! EVER. Sign up totally at your risk. Again – Sign up totally at YOUR OWN RISK. [ CLICK HERE ] for this Application. Lastly … [ THIS ] facebook Group has a list of 198 Direct Shippers to contact. This list was complied by me Searching both Facebook and Instagram for Direct shippers. Huge thank you to Frances from Freebie Joy with Lana for there huge list. Also, Thanks to [ YoFreeSamples.com ] and [ Freebies Contests and Reviews ] for adding to this list. JOIN OUR AMAZON FREE SAMPLES GROUP! Free Samples Group >> CLICK HERE << To Join! Thank you everyone for sharing your freebies. #Direct Shipping. I wasn’t able to message all but got the ones I was able to.